Subject: Plate 81 : 'N. W. Mexico en Oud Californie.' 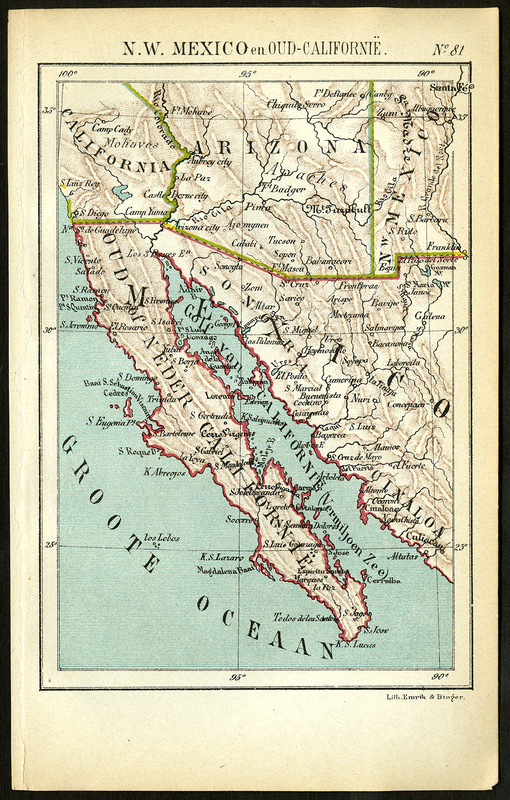 (Northwest Mexico and Old California). Condition: General age-related toning and occasional light stains from handling. Please study image carefully. Medium: Lithograph on a vellin type of paper. Size (in cm): The overall size is ca. 7.3 x 9.3 cm. The image size is ca. 4.1 x 6.2 cm. Size (in inch): The overall size is ca. 2.9 x 3.7 inch. The image size is ca. 1.6 x 2.4 inch. Description: This lithographed map originates from: 'Wereld-atlas voor Kantoor en Huiskamer' (transl: World Atlas for the office and living room), by J. Kuyper, published in 1880 - 1882 in Amsterdam, The Netherlands by G. L. Funke. Artists and Engravers: Jacob Kuyper (1821 - 1908), Dutch cartographer.